Weekly Roundup: VTA Service Changes, Car-Free Streets in South Bay – Peninsula Moves! Sip Spirits at the San Carlos Art & Wine Faire: The residents of San Carlos will celebrate a quarter-century of good times this weekend when the city hosts its annual Art & Wine Faire. The 25th version of the event will feature live musical acts, a classic car hot rod show, wine and beer pairings, tasty food treats, a “Family Fun Zone” with kids’ activities and games, and an array of displayed work from more than 275 local artists. The event will last from 10 a.m. – 6 p.m. on Saturday and Sunday, with music scheduled from noon to 4:30 p.m. on both days. Located in downtown San Carlos, the Art & Wine Faire is just a short walk from the San Carlos Caltrain Station. Caltrain’s weekend schedule provides plenty of options for attendees travelling to the event. VTA Making Quarterly Service Changes Next Week: The Santa Clara Valley Transportation Authority will implement service changes on October 12 as part its quarterly revisions process. Like SamTrans, the VTA has regularly-scheduled service adjustments as a way of responding to traffic and commuting developments. Changes planned for next Monday include tweaks to the Community Bus lines 48 and 49, which will leave a little later to help meet the needs of students travelling between the Winchester Transit Center and Los Gates High School. The Express Line 102 will also see alterations, as its afternoon trip will be moved 10 minutes earlier, to help commuters travelling between South San Jose and Palo Alto. A full list of the changes is available on the VTA website here. Car-Free Event Makes Debut in San Jose: Pedestrians, bicyclists, roller skaters and other exercise enthusiasts will be able to enjoy car-free streets in San Jose as part of the inaugural Viva Calle program in San Jose on Sunday. 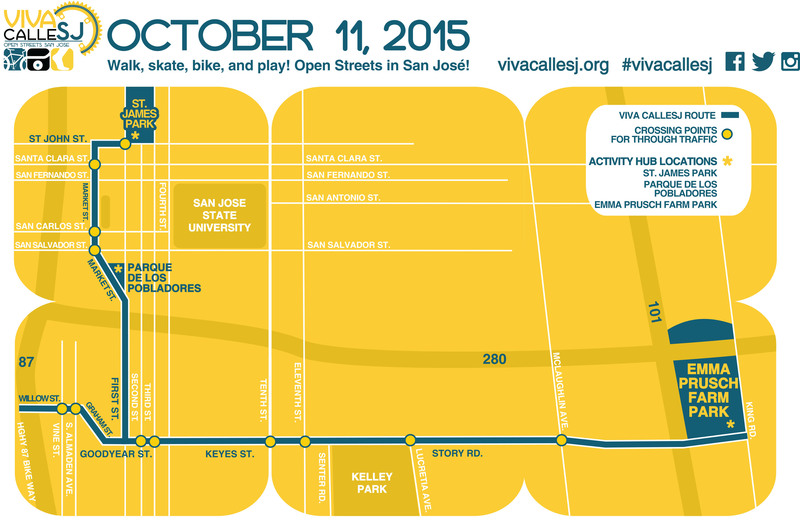 Much like San Francisco’s popular Sunday Streets gatherings, the Viva Calle is free event that will take place from 10 a.m. – 3 p.m., when portions of downtown San Jose will be closed to automobile traffic. The six-mile route will take place on segments of Market Street, Keyes Street and Story Road between Emma Prusch Farm Park and St. James Park. Along the route there will be free yoga lessons, stunt shows from BMX cyclists, chalk mural drawings and special presentations from the Happy Hollow Park and Zoo. The Viva Calle will also coincide with the Heroes Ride, an event set to honor San Jose Police Officer Michael Johnson, who was fatally shot March 24, 2015 while in the line of duty.